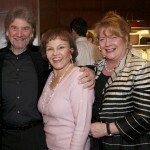 LX New York’s Jane Hanson visits with Maria Elena Holly at True Love Ways event co-hosted by Songmasters and PJ Clarke’s in NYC on April 28-29, 2011. 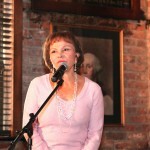 The event, held at PJ Clarke’s, was a tribute to Holly’s great music and their great romance. 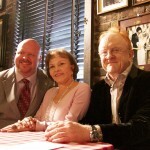 It featured Peter Asher, producer of Listen To Me: Buddy Holly, Maria Elena Holly, (Buddy Holly’s widow) and John Thomas of the Buddy Holly Guitar Foundation, which awarded Peter Asher the coveted True Love Ways guitar. 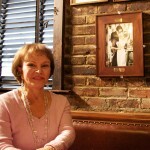 PJ Clarke’s also unveiled a never before published photo of Buddy and Maria Elena’s wedding kiss, the True Love Ways photo, which was permanently mounted over Table 53 where Buddy proposed to Maria Elena Santiago on June 20, 1958. Buddy wrote True Love Ways as a wedding gift for Maria Elena, a song which Peter Asher and his singing partner Gordon Waller made a worldwide sensation in the 1960s. 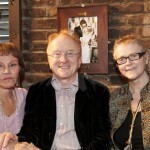 On April 29 PJ Clarke’s will hold a private tribute to one of the great true love stories in music history, the whirlwind courtship and marriage of Buddy and Maria Elena Holly – which started at PJ Clarke’s on their first date. PJ Clarke’s is the very spot where Buddy Holly proposed to Maria Elena, whom he had just met that morning, on June 20, 1958. They were married up until his untimely death on February 3, 1959. During Buddy Holly’s short life as a singer, songwriter and musician, he became a musical sensation whose prolific and popular musical legacy is now legendary. Holly was recently rated #13 in Rolling Stone magazine’s list of the Top 100 rock performers of all time. Holly wrote the song “True Love Ways” for Maria Elena in celebration of their wedding. It was later made popular around the world by the English “Mod Duo”, Peter and Gordon. 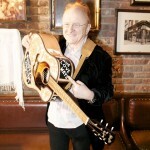 Peter Asher will give a live performance of “True Love Ways” at PJ Clarke’s, onstage, accompanied by original footage of Gordon, now deceased, in an early performance of this song on video. 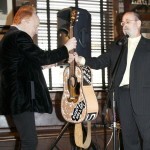 The Buddy Holly Guitar Foundation, famous for loaning its few existing and highly coveted “Holly Guitars” to outstanding rock musicians, will award Peter Asher a two-year loaner of the “True Love Ways” guitar. Asher will perform using this guitar. Asher has been a lifelong fan of Holly’s work, and has done much throughout his own career to promote and use Holly’s music – through Peter and Gordon’s True Love Ways, with his production of Linda Ronstadt’s classic re-work of Holly’s “It’s So Easy” and now with the upcoming release of his production of Songmasters’ Listen To Me/Buddy Holly album. The Buddy Holly Guitar Foundation is building eighteen perfect recreations of the 1943 guitar on which Buddy wrote many of his best-known songs. 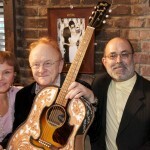 The Foundation lends these instruments, each of which bears one original fret from Buddy’s famous Gibson J-45 guitar, to artists like Peter Asher whom the Foundation’s Board of Directors deem exemplary of Buddy’s artistic vision and who have committed to raising funds for non-profit organizations that support music programs for children. Songmasters, launching its Listen To Me series celebrating the True. Great. Original. artists of contemporary music this summer, is co-hosting this event. This series features today’s great performers honoring their musical roots to raise substantial support for the next generation of outstanding music makers and entrepreneurs. Benefiting music industry charities include the Grammy Foundation, Artists House, and the Songwriters Hall of Fame, which will award it second Holly Prize, endowed by Songmasters, in June. Peter Asher, a multiple Grammy winning producer, is currently music producer for Songmasters’ Listen to Me series, Peter’s first album in the series, Listen to Me/Buddy Holly, includes tracks by Stevie Nicks, The Fray, Jeff Lynne, Natalie Merchant, Patrick Stump, Jackson Browne, Chris Isaak, Cobra Starship, Pat Monahan of Train, Ringo Starr, Imelda May, Brian Wilson and more. The album is scheduled for release around Labor Day. PJ Clarke’s will also commemorate the famous booth where Holly proposed to Maria Elena, by mounting the “True Love Ways” photograph, a previously unpublished photo of their wedding kiss. 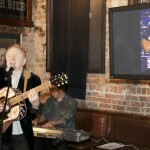 Peter Asher is also performing at Feinstein’s in New York City, May 3rd through 7th. Recording of the inaugural Listen to Me album is well underway. Part of an ongoing, music industry wide, multi-media celebration of the True. Great. Original. artists the album is featuring today’s great performers honoring their musical roots to raise substantial support for the next generation of outstanding music makers and entrepreneurs. 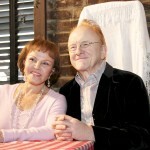 Peter Asher is producing the series. Listen to Me:Buddy Holly includes tracks by Jackson Browne, Cobra Starship, Zooey Deschanel, The Fray, Chris Isaak, Lyle Lovett, Jeff Lynne, Imelda May, Natalie Merchant, Pat Monahan of Train,(of Train), Stevie Nicks, Ringo Starr, Patrick Stump, Brian Wilson, and more surprise and bonus tracks. Look for it around Labor Day. 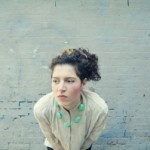 Congratulations to Kendra Morris who has been selected as 2011 Holly Prize winner. 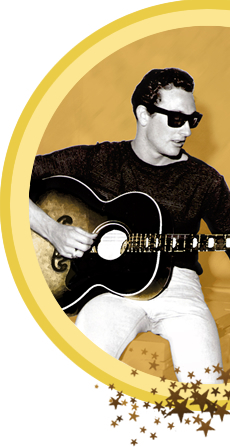 On June 8, 2010, the Songwriters Hall of Fame awarded the first-ever Holly Prize, a new award made possible by Songmasters and administered and juried by the Songwriters Hall of Fame as a tribute to the legacy of SHOF inductee Buddy Holly. The Holly Prize recognizes and supports the “all-in songwriter,” an exceptionally talented and inspired young musician/singer/songwriter whose work exhibits the true, great, and original qualities of Holly’s music and life. 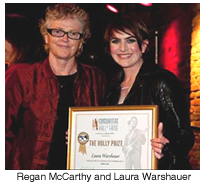 New Jersey native Laura Warshauer received the first Holly Prize in recognition of her accomplishments in what Regan McCarthy, Songmasters’ Senior Partner, described as the “triathlon of music” – that rare ability to write great songs, sing them superbly, and play the music exceptionally well at the same time. Songmasters will continue to sponsor the Holly Prize as a way to develop the talents and promote the careers of breakthrough “all-in-songwriters” through SHoF. Additional support for the SHOF will come from the Listen To Me: Buddy Holly recordings, in production under music great, Peter Asher. See SHoF Today news section for the full text of the June 9, 2010 press release. 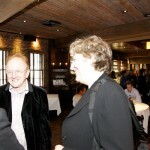 See Laura perform at the award ceremony. On June 8, 2009 Songwriters Hall of Fame Chairman/CEO Hal David announced the creation of The Holly Prize, a new scholarship made possible by Songmasters as a tribute to Buddy Holly, a SHOF inductee. The Holly Prize will recognize and support talented new singer/songwriters whose work exhibits the qualities of Holly’s music: true, great and original. The Holly Prize inauguration coincides with Songmasters’ launch of Listen to Me: Buddy Holly, a multi-media celebration of Buddy Holly, created in collaboration with Maria Elena Holly. 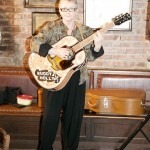 “Buddy Holly was one of music’s true pioneers. His unique style and all-around talent as a songwriter, performer and producer is still a major influence on today’s music. He was committed to controlling his own artistry and to helping other young musicians do the same. We are thrilled that Songwriters Hall of Fame wants to recognize that same spirit in the next generation of songwriters,” says Jennifer Cohen, Managing Partner of Songmasters. The Holly Prize will be administered and juried by the SHOF, and Songmasters will provide the support for the cash prize and recognition award. The first Holly Prize will be awarded in June, 2010, during the Songwriters Hall of Fame presentations of the Abe Olman Scholarship Awards For Excellence In Songwriting. See SHoF Today news section for the full text of the press release.